Most family albums are unremarkable, but, nostalgia as we know, can be a tricky customer. As a photographer, and more so as an editor-of-photography, the exercise of going through a family album can be testing, and fraught with danger – too many pictures there which “could have been better”. When I was growing up, our home too had several photo albums – the ones with black pages and deckle-edged black and white photos affixed with photo corners. 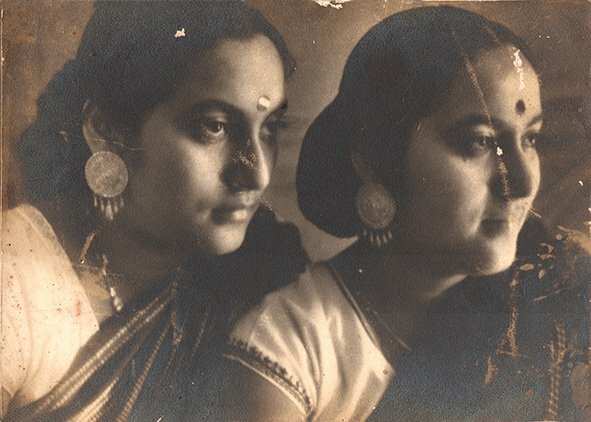 One afternoon, in Calcutta (now Kolkata), my mother and I began organising the albums sticking back some photos that had come loose. There we were pouring over pictures of what could best be called a rather haphazardly maintained record of the last two generations of my family’s middle-class existence. And then I found this picture that made me stop. 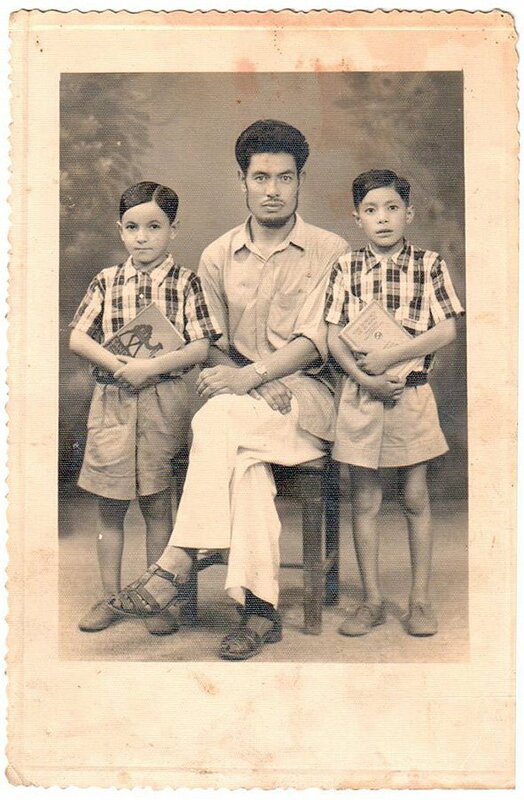 It was a picture of my father, my baba, Subir Chaudhuri aged 26, or 27. Studying that picture carefully, the crumpled white kurta-pyjama told me that it was perhaps shot early in the morning. 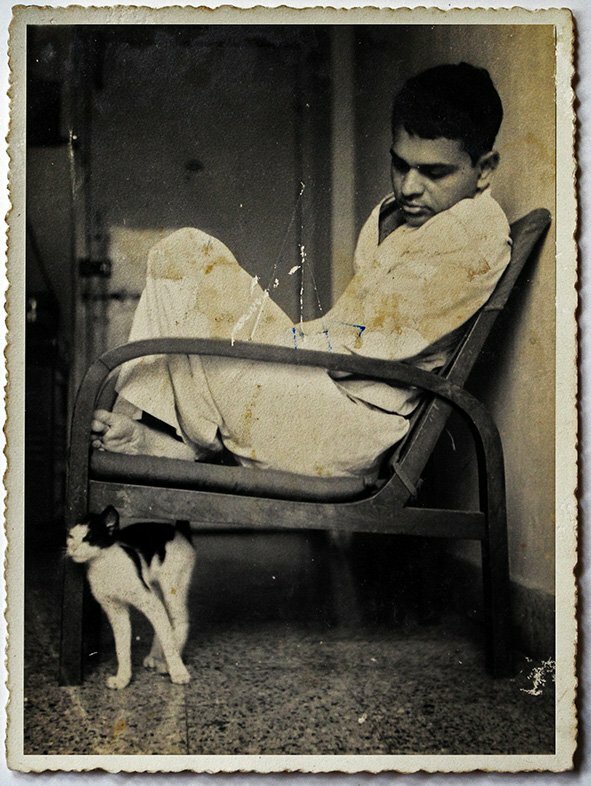 There is also an unmistakable hint of sleep still hanging over the young man as he sits cross-legged, looking down towards a cat which is lazily rubbing itself against the front leg of an easy-chair. The print had yellowed and was damaged; a ball-point pen gash (most likely done by a very young me) sits agonisingly in the centre of the frame. Each time, I have looked at this picture, since making the discovery; I have always wished I was the photographer. I remember thinking, my father was not a bad looking chap. 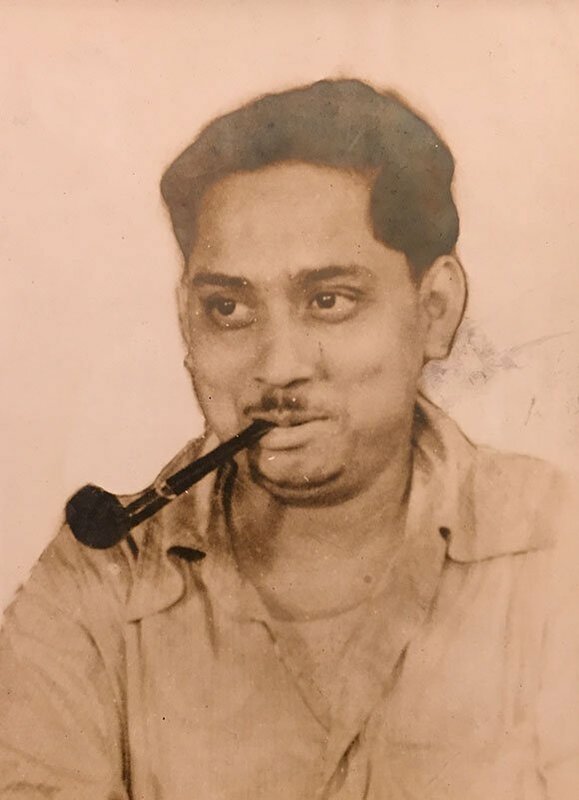 My father had begun working at Philips (formally known as Koninklijke Philips N.V. / Royal Philips) in Calcutta in 1964 in the company’s Head Office and soon, in 1966, the Head Office shifted to Bombay and as part of that transition, he too moved to Bombay (now Mumbai). There is also a pamphlet my mother, Kanika, has kept safely, where you see him featured as a model for a Philips Double Beam Oscilloscope. Baba always gets embarrassed when I probe to ask him about that incident about how he came to model for that advertisement. But he smiled when I showed him this picture with the cat. I expected memories to flood over him but there was no more than a trickle. He remembered that the picture was shot sometime around 1969-70 by his friend, Dipankar Basu or Dipankar Kaka as we kids called him. 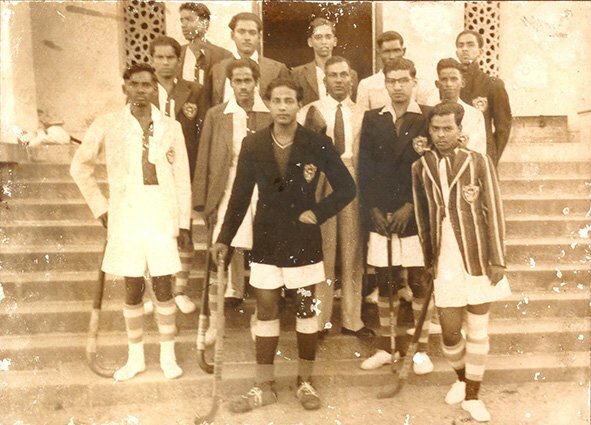 They were all bachelors then, young Bengali boys, who had found themselves together through coincidence far away from home, during the industrial boom, sharing a small 1-BHK flat in Navjivan Society in the eastern suburb of Chembur in Bombay. Initially, my father stayed in this flat alone as the lone tenant. Some months later Dipankar kaka was looking for accommodation and so moved in with my father. 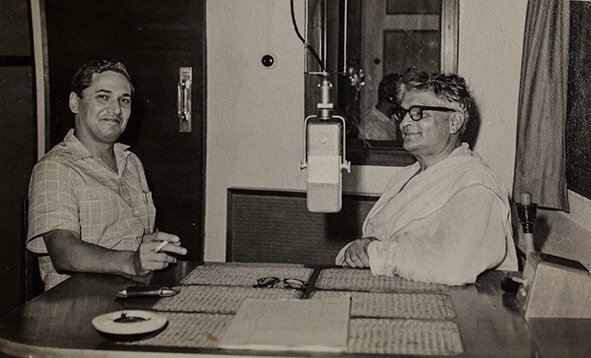 Dipankar was baba’s close friend, Soumitri Sen‘s friend. They were both textile people who had moved to the city as it was then the textile hub. 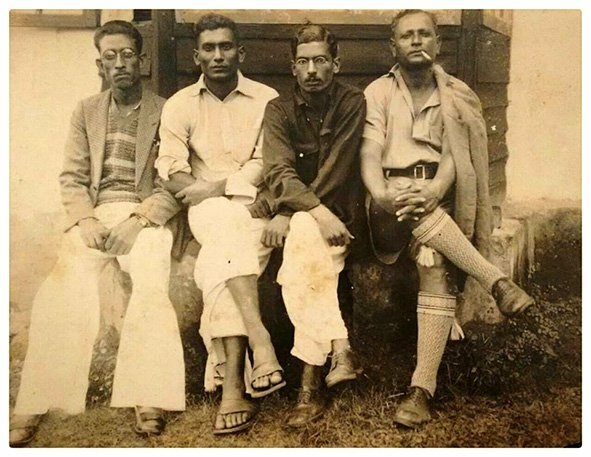 Many of these men who lived with Baba, were not his friends ; they were people he came in contact with in Bombay. Baba recalls “It was a Sunday morning. That cat used to sometimes come in from the balcony of our flat whenever the door was left open,” he told me. Though not much else of that ground floor house can be seen in this picture there are details of my life in that house – our home – outside the frame of the image which return to memory each time I see this picture. It’s the house I spent the first 18 years of my life. I remember that chair vaguely. Those floor tiles, strangely a particular chipped one I remember most vividly, maybe because so much time was spent on that living room floor drawing or else playing with friends during my summer vacations. As a photographer, I am bowled over by the beauty with which the languorous quality of a holiday morning has been recorded, quite inadvertently, by the photographer. 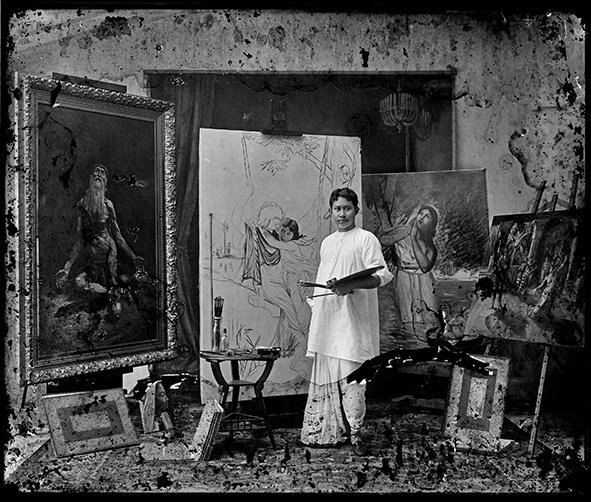 “Dipankar had only an amateur’s interest in photography”, says Soumitri Sen or Shomu Kaka, who was also part of their group. Picture making involves decision making…many small decisions made in quick succession. And so, I have often wondered what may have been going on in Dipankar Kaka’s head when he shot this picture. Firstly, I can’t understand what an amateur would be doing fiddling with a camera at home early in the morning. It’s such an unusual moment, a candid one in the middle of formal ones like birthdays, weddings and vacation-time group photos where everyone poses awkwardly. Was he just trying to take that last picture so he could develop his film? Or had he shot any others that morning? If he had, unfortunately, none are around. What were the aesthetic choices he might have been considering while framing the shot as he was peering over the ground-glass? Did he select this particular frame to be printed or was it the printer at the studio who chose it because it had the best exposure? 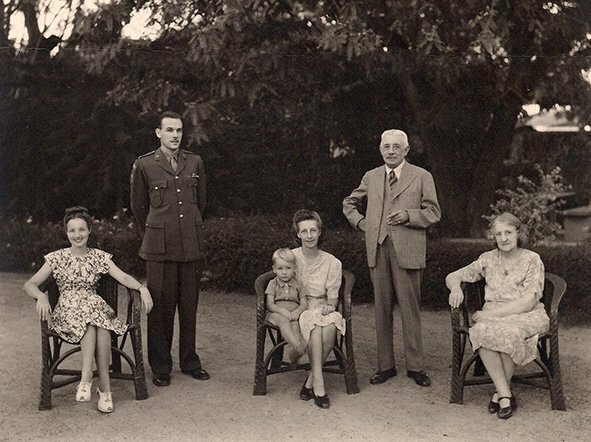 There is another version of this picture – a square crop in which you see my father’s slippers placed neatly in front (my father has always been quite a dapper of a man who I can’t remember ever having seen bare feet) and so, I wondered what the full negative was like. I have tried to locate that negative from Dipankar Kaka’s daughter but we have been unsuccessful. I had never met Dipwanita, but this search brought us together, first on Facebook and then at a bookshop café in Pune. There is much I am curious to know about the making of this picture but that is now impossible. Dipankar Kaka is no more. 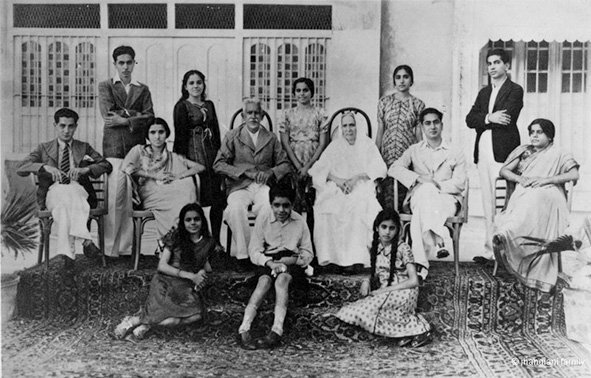 This picture is of my mother, the little girl in the center, and her immediate family taken around 1931 or 1932 in a British photo studio in south Bombay [maybe Kalbadevi]. There is no stamp on the photograph so I can’t tell which studio it may have been. 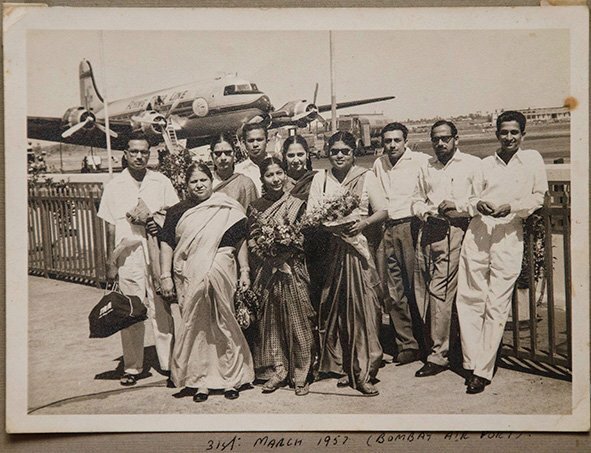 My grandfather in this picture brought his family to Bombay specifically for having a series of photographs taken in the studio. 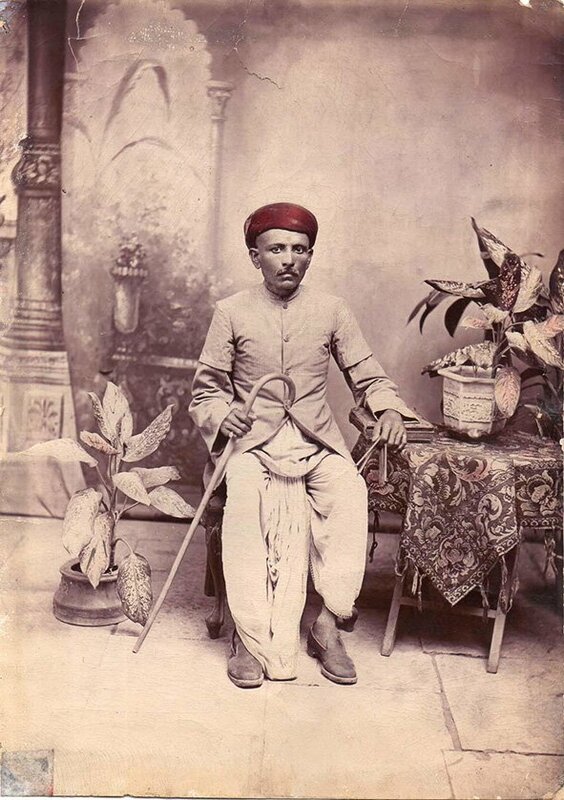 He was very fond of studio portraiture and would travel to Bombay often to get his pictures taken. 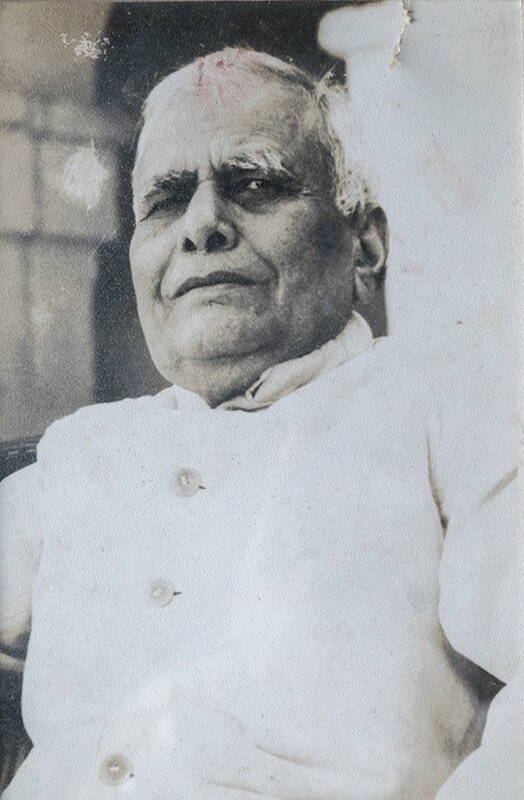 My grandfather, His Highness Malhar Rao Narayan Rao Puar was a King of a small kingdom in now Madhya Pradesh, near Indore called Dewas. Originally his family were Rajputs who like several of the other Rajput nobility embraced the Maratha/Peshwa fold and began adopting the Maratha language and customs in addition to their Rajput heritage. His family claimed to be descendants of Vikramaditya, the legendary emperor in ancient India. I hope it’s true. 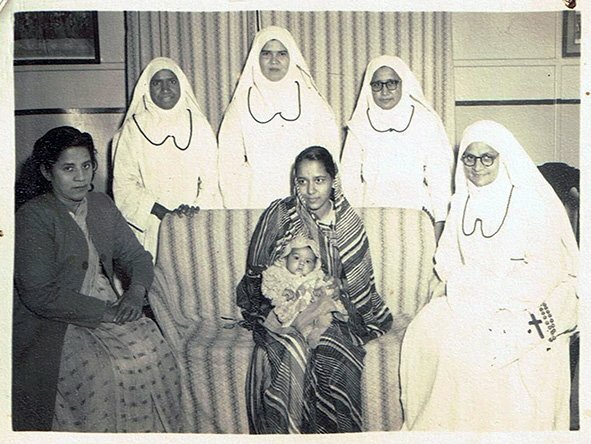 Seated on the extreme right is my maternal great grandmother, a lady called Krishna Rao Salgaocar. She was a commoner and belonged to the erstwhile Devadasi tradition from the Devadasi house of Saligao in Goa. 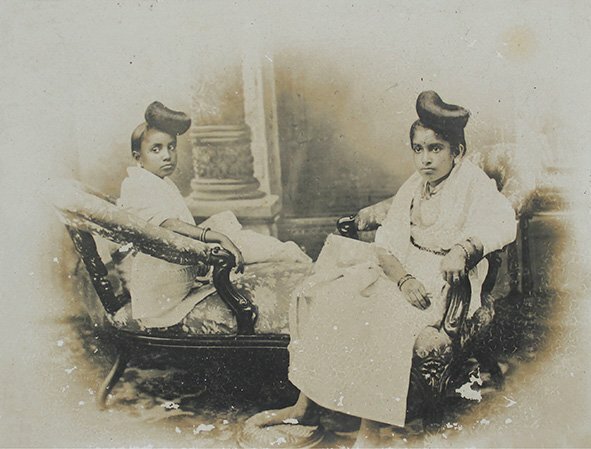 In this photograph, she wears black (or navy blue) because she considered herself to be a widow of the father of her children, who while alive was a leading businessman of that time but refused to accept his children as legitimate – as was usual at the time when it came to relationships or children with Devadasis. The social status of the Devadasis had gradually fallen from tradition of respectability and equality over the centuries. On the extreme left is her daughter, my grandmother, the lady who partially raised me and inculcated in me the love for art, mythology and cooking. She was born a Devadasi and was named Indira Salgaocar. Devadasis couldn’t take the last name of the men they were with, so they took the name of the house that they belonged to. 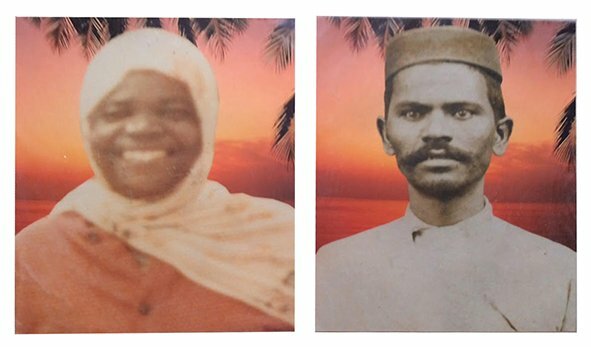 My great grandmother belonged to the Salgaocar house from Saligao – one of the two villages in Goa who produced some of the most beautiful and most famous of Devadasis. The other village was Mulgao. My grandfather, the King was an early widower with no children, and so someone in court sent to him my grandmother, a young beautiful woman as a diversion and to keep him company. He found my grandmother to be a beautiful, sprightly, lively, ambitious and a highly intelligent woman. She was immensely attractive to him as a companion. Given that she was a Devadasi’s daughter she was skilled in all sorts of arts, crafts, and cooking – a woman of multiple talents. He fell in love with her head over heels and decided that protocol will be damned. He married her in 1915, and made her his queen, his Maharani. As long as he was alive, no one could question him or say anything, but given that my grandmother was a commoner, the British called it a Morganatic marriage – A marriage of unequal social rank that would prevent the passage of the husband’s titles and privileges to the wife and any children born of the marriage. When Indira married my grandfather she became Her Highness Prabhavati Raje Puar – a new name that was chosen for her based on her horoscope as per Maratha customs. In front of my grandfather are their two children, my mother Princess Shashiprabha Raje Puar, age 10 and her brother, age 12, my uncle, Prince Martan Rao Malhar Rao Puar. 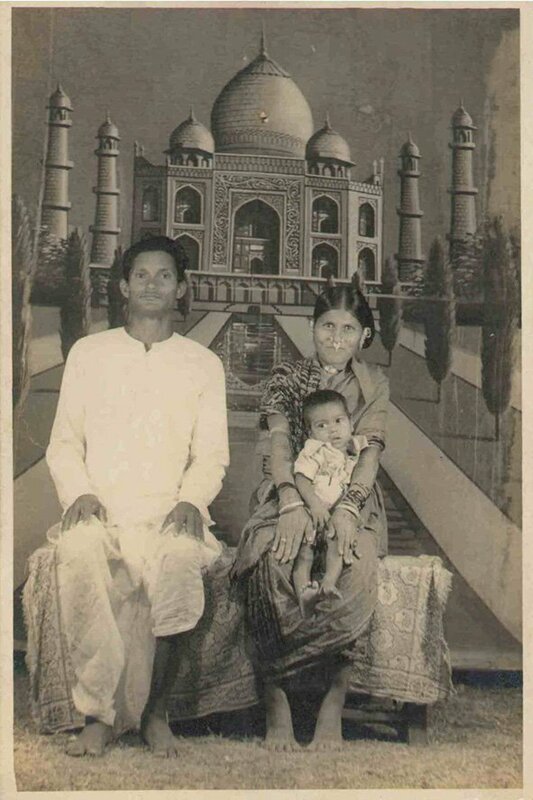 Two years after this photograph was taken, my grandfather, the king suddenly passed away and my grandmother and her kids were banished from the kingdom of Dewas. The marriage to the king no longer had a place in their society and the throne of the Kingdom of Dewas was succeeded by my grandfather’s step-brother. 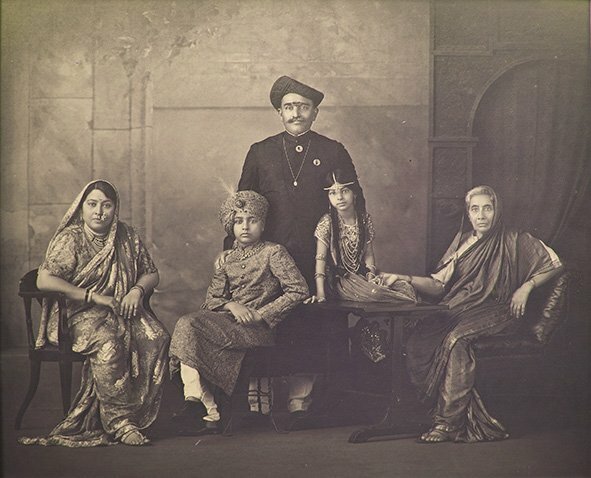 My grandmother, the banished Maharani along with her two children and some personal assets moved to Bombay – They first lived in Walkeshwar, then in Gamdevi and lastly in Colaba until the 1980s. For a while, they lived off their personal assets of gold, silver, cars and jewels, but in time all the wealth was spent and the world too had changed. My uncle, the Prince in the photograph served with the British Army until his death at the age of 51. He was a really gentle and a very nice man. My mother Shashi too grew up to be a beautiful and an amazing woman. 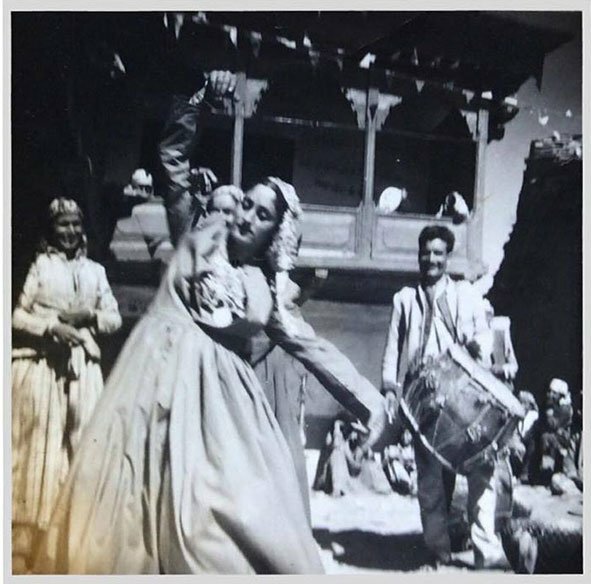 She met my father Kanwaljeet Singh also known as Cammii, at a ball dance at the Taj Mahal Palace Hotel in the 1940s. They fell in love, eloped and got married in a temple in 1942. They had two daughters but soon realized that a temple marriage was not recognized by the court of Indian law and my father had to move the Supreme Court of India to get the law changed and make his marriage legally recognised. After I was born and my parents got divorced, my mother worked in my school as a nursery teacher, then in a passenger liner as a children’s stewardess. Considering the reality checks in her life, my mother was pragmatic enough to handle her past as a royal princess and her humble life after, with utmost grace. There have been people who have pointed out the scandalous past of my maternal family and I have shown them the door. I think the women in my family were strong, individualistic and beautiful women who made the best of their lives. Many people in India are embarrassed to talk about their Devadasi origins because society and history don’t look very kindly upon it, but it was their reality – and yes, it was highly exploitative state of affairs. Some of our early singers and actresses in Indian Films came from the Devadasi tradition because they couldn’t afford to be ashamed. They were forward and bold women who decided to earn their own keep. I don’t see the frowning upon as justified, but everyone is entitled to their own point of view. I have fashioned my own life upon not caring about society’s opinions, and it has worked out just fine. Earlier, when I looked at this photograph I used to feel a sense of lost glory, but now I feel great pride in my ancestry. My grandfather was a good man, a spiritual man and he didn’t care that his wife came from the background of a Devadasi. He was proud and happy to have her as his wife and welcomed his mother-in-law, also a Devadasi, in his palace. Not many people would have the gumption to do that, even today. 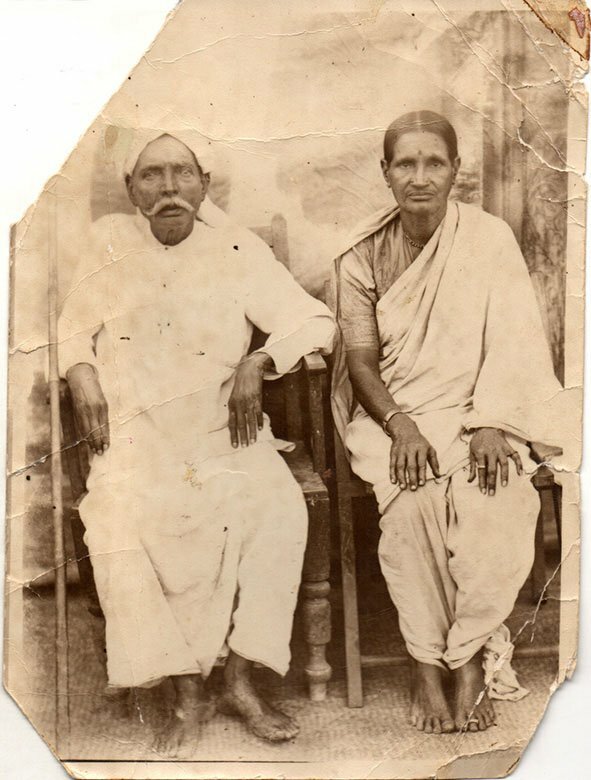 This is a photograph of my grandparents Champa Tai and Vasant Rao taken shortly after they got married. On the right is an invitation to my grandmother’s wedding in 1941. It has been carefully preserved by the family and was handed over to me by my mother recently. I treasure it, not because of the sentimental reasons, but because it tells a story of far greater significance. This wedding invite is unique because it proudly announces the bride’s educational qualifications, right next to her name. You have to keep in mind, that women’s education at that time in ancient India was almost non-existent. My grandmother had decided quite early on that she will be educated first and then get married. As a child, she lost both her parents very early and was brought up by her two elder brothers who completely understood and encouraged her dream. However, there was a problem – There was no school for a young brahmin Maharashtrian girl to study in. The brothers got her to Poona (now Pune) where the well-known social reformer, Maharshi Karve had started a school for girls, as well as an ashram where young widows could live and learn. This concept was alien and completely norm shattering for the brahmins of Poona leading to the resistance to opening such a school to be set up in the main city. Maharshi Karve had no choice but to set up the school on the outskirts of Poona. He braved all odds and went ahead with his mission of educating women. There wasn’t even a road to get there, so the teachers and students made a path through the fields to reach the school. My grandmother Champa, was amongst the very first ‘Kumarikas’ (young unmarried girls) to actually live in this ashram from the tender age of nine. The family was progressive and agreed that it was indeed important for a girl to be educated. 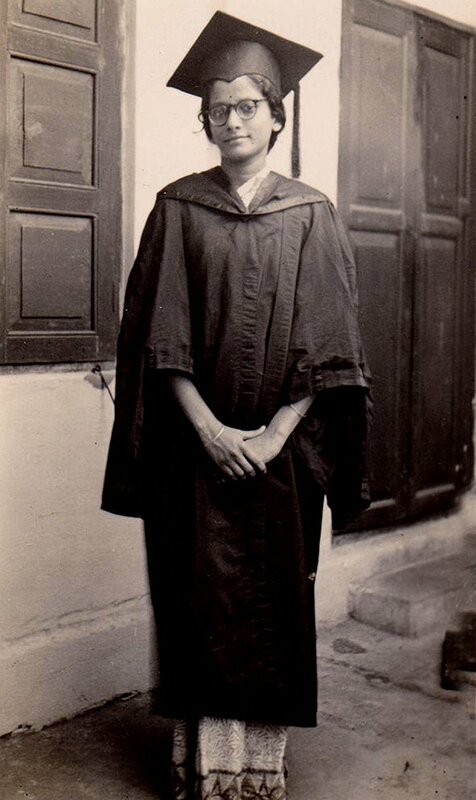 At the end of it, she earned the princely degree of GA that stood for ‘Gruhita Aagamaa‘ a Sanskrit title which could loosely translate to a BA degree today. Luckily my grandmother got married into an educated family. My grandfather, the groom Vasant Rao was an MSC in Zoology himself and went on to do his Phd. He later taught at Elphinstone College in Bombay (now Mumbai) and his father was a doctor who had educated himself in London. They were very happy to welcome this qualified girl into their family. Several years and two kids later, while managing a large joint family in Bombay, my grandmother did her Masters and then a one year course, equivalent of a B.Ed. She taught English and Marathi to the ‘metric’ students in Dyaneshwar Vidyalaya in Wadala, Bombay, for 15 years. She was highly revered by her students. In the 16th year of her career she gave it all up. My grandmother had to visit her son in the USA, that year and considering she would be gone for three months, her integrity could not allow the students suffer because of her absence. She decided to take on extra teaching classes and made sure that she completed the important portion for her students, and then she simply quit. The principal was shocked. If she took leave, then they would have to look for a temporary teacher to take the classes, and temporary teachers were not easily available and neither did they put in their best because they were after all, temporary. The principal told her that the pay scales were rising that year and that should she stay in the job and benefit from it. The pension would be higher too. But my grandmother would have none of it. She did not want her students to suffer on account of her. He pleaded but to no avail. They did not want to lose their best teacher. But she did not want to be unfair to her students. 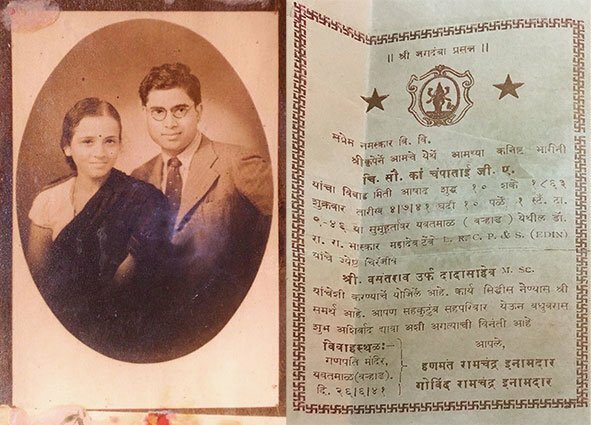 It needs to be said that my grandparents came from a middle-class Maharashtrian family and money was important. It must have needed a lot of gumption to be able to make this decision. For years, my grandmother’s students came to share their joys and successes with her. She did not suffer fools and did not hesitate to give people a piece of her mind if she felt that there was reason to. She had the most open mind where no topic was taboo. 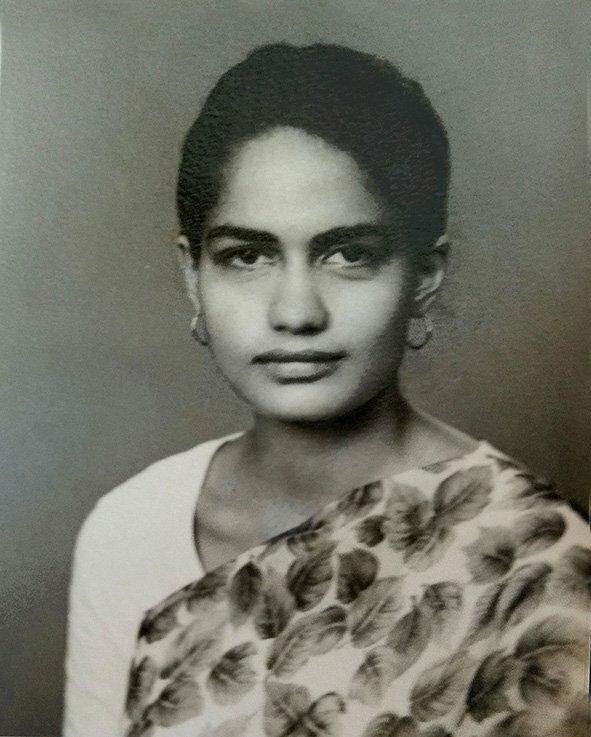 My grandmother Champa Tai, was a woman ahead of her time. I am proud to have known her. On this woman’s day in 2016, I salute her, for following her dreams and always standing up for what she believed in. My husband, Fehmeed Siddiqui and I, Nargis Jahan. Karachi, Pakistan, 1975. Image and Text contributed by Nargis Jahan, Karachi. My husband Fehmeed was born and brought up in Lucknow, and spent his early years darning cloth at his father’s shop in Hazratganj. He would often tell me about his struggles in Calcutta (now Kolkata), where he moved to in 1965, while in his mid-20s, to find better work. He also spoke about the gruesome violence he witnessed between Hindus and Muslims there, how it shook him, and prompted him to move to Karachi, where his paternal relatives lived at the time. 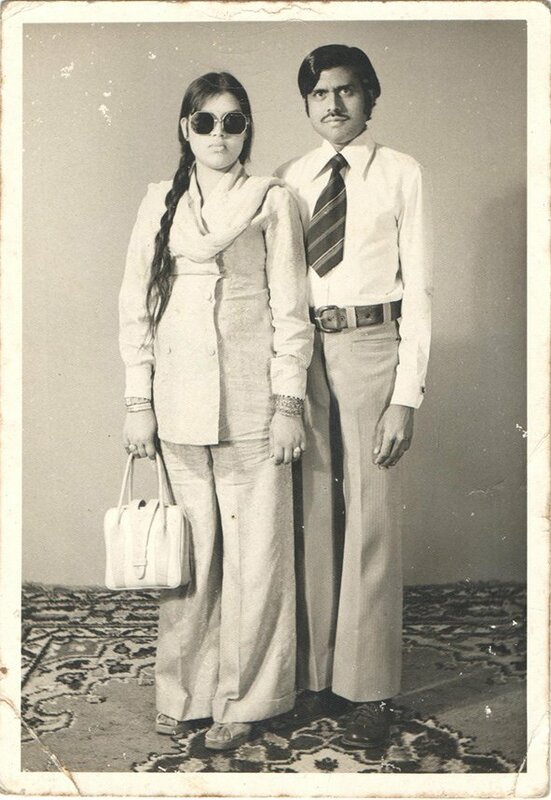 After migrating to Karachi, he found work at a shop selling carpets and a few years after, when some mutual relatives arranged our match, we got married in 1974. In this picture, Fehmeed and I were about eight months into our marriage, and still getting to know each other. He would take me out on dates a lot, and frequently to Karachi’s Clifton Beach. This is a photograph from the time when Fehmeed took me out for our first photo shoot together to a studio on Tariq Road, a famous shopping district in Karachi (now Pakistan). He wanted it photographed so he could send it back to his home in Lucknow, India, to relatives who had not been able to attend our wedding. “What kind of a picture is this? !” my father growled when he saw it and did not allow us to send this photograph. Eventually, we sent another one where I am mostly covered in a burqa. Karachi was a completely different place then. Couples would be seen going out a lot more. There was a lot less violence. The street outside the photo studio where this was clicked was a popular tourist spot, and many foreigners would be seen sitting around at restaurants here. The pant-suit I am wearing, was stitched for me by a cousin who lived in Saudi Arabia. Such suits were in fashion in Saudi at the time, so he got about five or six of these for me. The goggles were a gift from another cousin in Lahore.